Ladytron gained legions of fans early this decade with the skeletal synth-pop manifestos 604 and Light & Magic, two stunningly unique records that threw down the stylistic gauntlet so hard that they actually named a track “This Is Our Sound.” But things really started getting interesting with 2005’s Witching Hour, which featured stronger songwriting, a newfound punk-ish intensity, and a beefed-up sound featuring buzzsaw guitars à la Jesus & Mary Chain. The just-released Velocifero may be their best yet—while school fans will love the dark dancefloor gems “Runaway” and “Deep Blue,” this isn’t a record by a band content to sit still. There’s an astonishing amount of range here: The edgy first single “Ghosts” rocks in way that would’ve been unthinkable for Ladytron just a few years ago, and the album closes with two lovely retro pop ballads that are about as far away as you can get from the straight-faced emotional void of their early work. 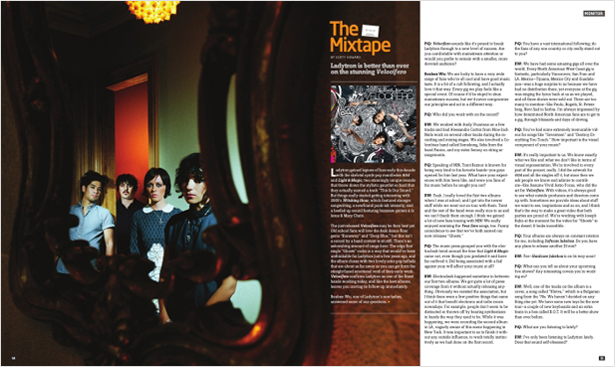 Velocifero confirms Ladytron as one of the finest bands working today, and leaves you craving its follow-up immediately. Reuben Wu, one of Ladytron’s non-ladies, answered some of our questions. PiQ: Velocifero sounds like it’s poised to break Ladytron through to a new level of success. Are you comfortable with mainstream attention or would you prefer to remain with a devoted cult audience? Reuben Wu: We are lucky to have a very wide range of fans who’re all cool and have good music taste. It is a bit of a cult following, and I actually love it that way. Every gig we play feels like a special event. Of course it'd be stupid to shun mainstream success, but we'd never compromise our principles to act in a different way. PiQ: Who did you work with on the record? RW: We produced it ourselves, with some additional production from a couple of friends. We worked with Andy Vicarious on a few tracks and had Alessandro Cortini from Nine Inch Nails work on several other tracks during the recording and mixing stages. We also involved a Colombian band called Somekong, Seba from the band Panico and my sister Semay on string arrangement. PiQ: Speaking of NIN, Trent Reznor is known for being very kind to his favorite bands—you guys opened for him last year. What have your experiences with him been like, and were you fans of his music before he sought you out? PiQ: The music press grouped you with the electroclash trend around the time that Light & Magic came out, even though you predated it and have far outlived it. Did being associated with a fad against your will affect your music at all? RW: Electroclash happened sometime in between our first two albums. We got quite a lot of press coverage from it without actually releasing anything. Obviously we resisted the association, but I think there were a few positive things that came out of it which benefit electronic and indie music nowadays. For example, people don't seem to be distracted or thrown off by hearing synthesizers in bands the way they used to be. While it was happening, we were recording the second album in LA, vaguely aware of this scene happening in New York. It was important to us to finish it without any outside influence, to work totally instinctively as we had done on the first record. PiQ: You have a vast international following; do the fans of any one country or city really stand out to you? RW: We have had some amazing gigs all over the world. Every North American West Coast gig is fantastic, particularly Vancouver, San Fran and LA. Mexico—Tijuana, Mexico City and Guadalajara—was a huge surprise to us because we have had no distribution there, yet everyone at the gig was singing the lyrics back at us as we played, and all three shows were sold out. There are too many to mention—São Paulo, Bogotá, St Petersberg, Novi Sad in Serbia. I'm always impressed at how determined North American fans are to get to a gig, through blizzards and days of driving. PiQ: You’ve had some extremely memorable videos for songs like “Seventeen” and “Destroy Everything You Touch.” How important is the visual component of your music? RW: It's really important to us. We know exactly what we like and what we don't like in terms of visual representation. We're involved in every part of the project really. I did the artwork for 604 and all the singles off it, but since then we ask people we know and admire to contribute, like Assume Vivid Astro Focus who did the art for Velocifero. With videos, it's always good to see what outside producers and directors come up with. Sometimes we provide ideas about stuff we want to see, inspirations and so on, and I think that’s the way to make a great video that both parties are proud of. We're working with Joseph Kahn at the moment for the video for “Ghosts” in the desert; it looks incredible. PiQ: What can you tell us about your upcoming live shows? Any interesting covers you’re working on? RW: Well, one of the tracks on the album is a cover, a song called “Kletva”, which is a Bulgarian song from the 70s. We haven't decided on anything else yet. We have some new toys for the new tour: a couple of new keyboards and an extra brain in a box called B.O.T. It will be a better show. PiQ: What are you listening to lately, and did it influence Velocifero? RW: I've only been listening to Ladytron lately. Does that sound self-obsessed?